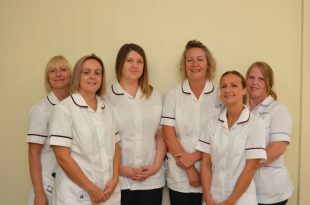 My name is Lynne Grey and I am a newborn hearing screening co-ordinator based in Northamptonshire. I want to share something we did at Kettering General Hospital recently to promote the importance of newborn hearing screening - and the feedback we had afterwards. Newborn hearing screening helps identify babies who have permanent hearing loss as early as possible so parents can get the support and advice they need right from the start. We're constantly looking to improve the service we offer parents and raise awareness of what it involves. The idea of telling people about my experience came after speaking to Jenny Neal (my co-author) who is a senior quality assurance advisor for the area in which I work. 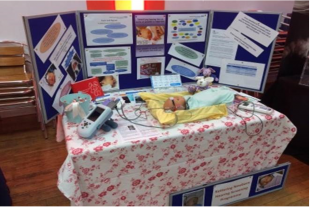 Recently my team ran a stand at an annual baby roadshow at Kettering hospital. Here prospective parents and families met maternity staff and other professionals involved in childbirth services. We were aware that the Screening tests for you and your baby leaflet families receive is given quite early in pregnancy, whereas newborn hearing screening is often carried out in the first 4 to 5 weeks of the baby's life. So we thought it certainly wouldn't do any harm to talk to these parents at the baby roadshow and remind them of the importance of newborn hearing screening and what it involves. This was certainly backed up by the findings of a survey we held after our visit. It was clear that many parents remembered the information they had been given at the baby roadshow. The team could not have been more helpful and friendly - it was a real pleasure. Thank you. Very friendly, informative and concise. I felt fully supported and the test was explained clearly. The screener was very gentle with my baby - a lovely lady. Thank you. The screener was very professional and informative. The screening test was quite simple and me and my baby were relaxed throughout. The test went really well. The screener dealt with my baby boy very gently and reassured him. I was very pleased with how it went was explained. I hope this example goes to show the value of getting feedback, which helps us to improve services to better meet the needs of families. It also gave us some evidence to support our own personal feelings that our visit to the baby roadshow had been useful to lots of parents. Hearing screening teams could think about finding out if their maternity unit hold these kinds of events and use them - like we did - to help spread the word of how important hearing screening is. It may also encourage parents to bring babies back if they need further appointments.